Are Miami millennials really able to afford homeownership? 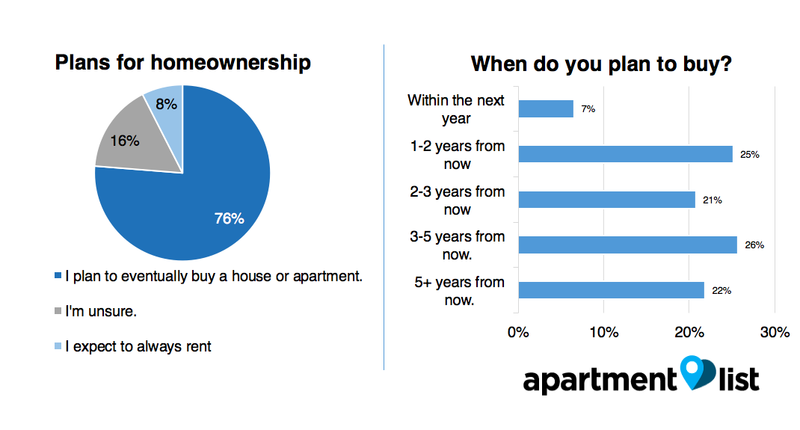 Apartment List recently conducted a survey of more than 30,000 renters across the United States, asking questions about their plans for homeownership, affordability, and savings for a down payment. Our research indicates that the vast majority of millennial renters (79 percent) want to purchase a home, but that affordability is the biggest obstacle that they face. You can see our national report (with data for 93 metros and 130 U.S. cities) at this link. Today, we dive into the results for the Miami metro specifically. In the Miami metro, 76 percent of survey respondents do want to purchase a home. Of these, the majority (26 percent) intend to buy a home within the next 3 to 5 years. The next largest group (25 percent) are planning to purchase in 1 to 2 years. This compares to other metros like Orlando, (where 28 percent plan to purchase within 3 to 5 years), Tampa (where 34 percent plan to purchase in 3 to 5 years), and Jacksonville (36 percent in 3 to 5 years). The biggest obstacle for Miami millennials wanting to buy a home is affordability, with 81 percent of respondents listing it as a reason for delaying homeownership. In contrast, only 32 percent said that they were not ready to settle down, and 28 percent were waiting to be married. 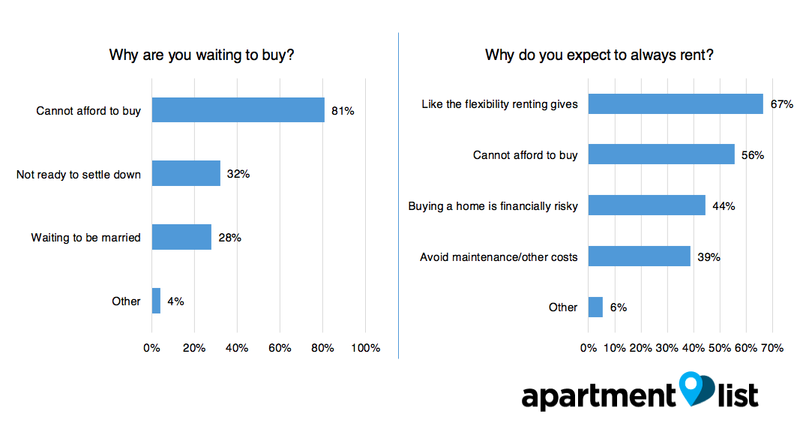 Miami metro renters also seem to put a high priority on flexibility, as those who expect to always rent said it was the no. 1 reason they would do so, even over affordability issues. To compare millennial expectations for the cost of a down payment with reality, we asked them how much they expected to need for their own down payment. 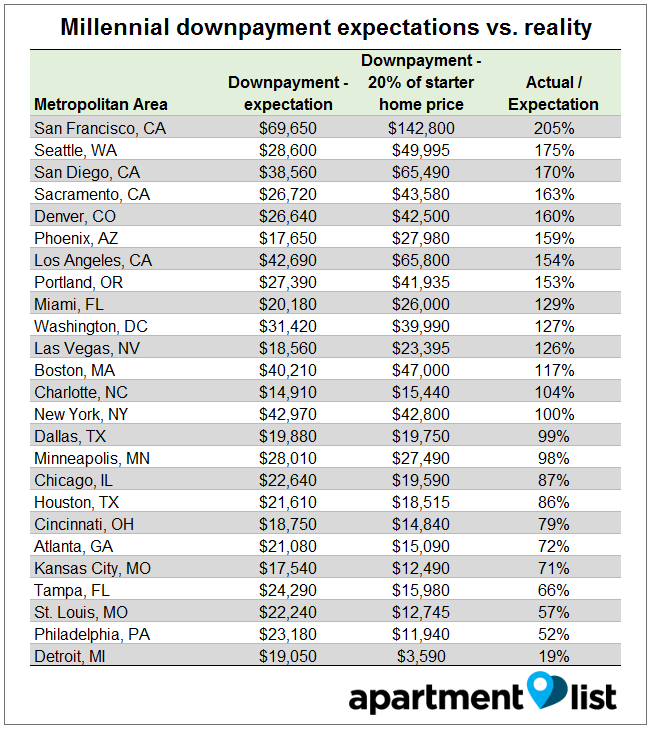 The median price of a 20 percent down payment for a starter home in the Miami metro is $26,000, and the average millennial expectation of how much they need for a down payment is $20,180 – a difference of 29 percent. This is unsurprising, given that most of the nation’s millennials tend to underestimate the cost of a down payment as well. However, on the other end, millennials in Tampa overestimate the necessary amount for a down payment on a basic starter home by 34 percent. This might hold implications for the type of starter home that Tampa millennials intend to buy. 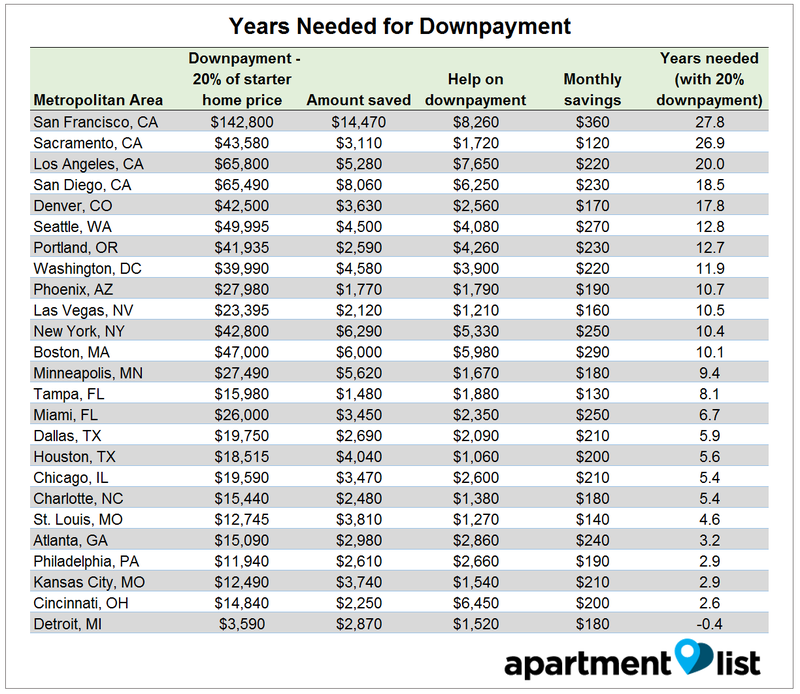 How much have you saved for a down payment so far? How much help (e.g., from family) will you be receiving for a down payment? How much of your monthly income do you put towards saving for a down payment? This allowed us to estimate how many years it will take them to save enough for a 20 percent down payment on a home. At the current savings rate in Miami, it will take millennial homebuyers about 6.7 years to save up enough for a down payment. This compares to 8.1 years in Tampa and 14.5 in Orlando. Despite the challenges that Miami millennials have with affordability, homeownership still seems within reach, as most can afford a down payment within seven years, even with their underestimation of down payment cost. Overall, Florida cities did relatively well, compared to other cities across the nation, such as Denver at 17.8 years or San Francisco at 27.8.